Since 2017's full length LP, No Hook 2, received the high praises it did, the Long Island duo of Dunbar (Sure Shot & Bunchy Cartier) took the time to perfect the sound and craft for their follow-up. 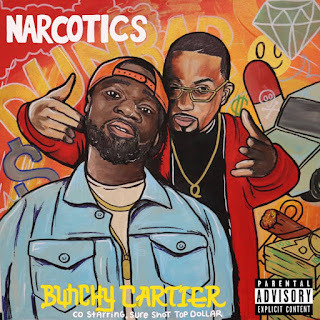 Blessing the webs and the trap with the newest full length, Narcotics, this serves as Bunchy Cartier's first solo effort with Sure Shot as a co-star here. latest signee, Raps New Generation's UFO Fev, the verses and production on this will make the words "Supreme, Thug, Gutter, Mafioso" ring off in your brain. All original production consisting of four different sounds - Chicago's Doc Da Mind Benda, Philly's Jewels Polaar, Florida's Backpack Beatz, and Long Island's Beats By Lawrence - you won't be skipping a single song on here. Run-backs necessary; jam responsibly!